Carotenoids and anthocyanins are the predominant non-chlorophyll pigments in plants. However, certain families within the order Caryophyllales produce another class of pigments, the betalains, instead of anthocyanins. The occurrence of betalains and anthocyanins is mutually exclusive. Betalains are divided into two classes, the betaxanthins and betacyanins, which produce yellow to orange or violet colours, respectively. In this article we show betalain production in species that normally produce anthocyanins, through a combination of genetic modification and substrate feeding. The biolistic introduction of DNA constructs for transient overexpression of two different dihydroxyphenylalanine (DOPA) dioxygenases (DODs), and feeding of DOD substrate (L-DOPA), was sufficient to induce betalain production in cell cultures of Solanum tuberosum (potato) and petals of Antirrhinum majus. HPLC analysis showed both betaxanthins and betacyanins were produced. Multi-cell foci with yellow, orange and/or red colours occurred, with either a fungal DOD (from Amanita muscaria) or a plant DOD (from Portulaca grandiflora), and the yellow/orange foci showed green autofluorescence characteristic of betaxanthins. Stably transformed Arabidopsis thaliana (arabidopsis) lines containing 35S: AmDOD produced yellow colouration in flowers and orange-red colouration in seedlings when fed L-DOPA. These tissues also showed green autofluorescence. HPLC analysis of the transgenic seedlings fed L-DOPA confirmed betaxanthin production. 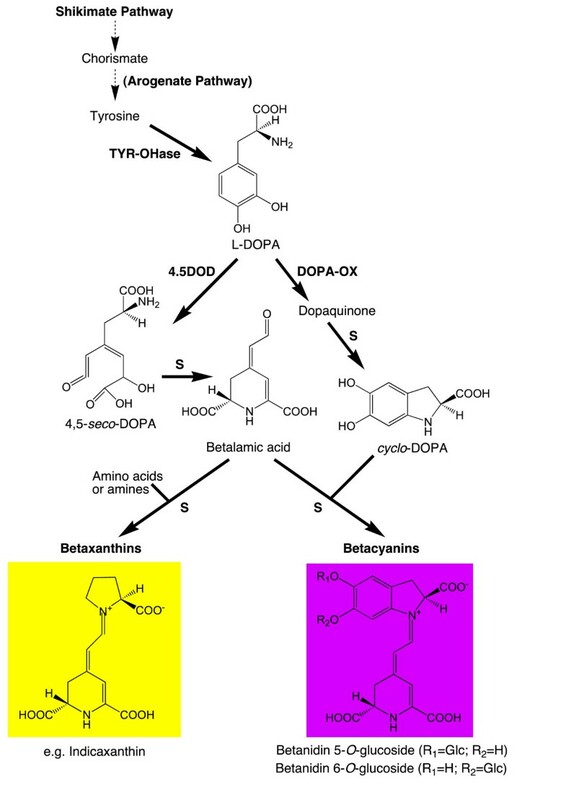 The fact that the introduction of DOD along with a supply of its substrate (L-DOPA) was sufficient to induce betacyanin production reveals the presence of a background enzyme, possibly a tyrosinase, that can convert L-DOPA to cyclo-DOPA (or dopaxanthin to betacyanin) in at least some anthocyanin-producing plants. The plants also demonstrate that betalains can accumulate in anthocyanin-producing species. Thus, introduction of a DOD and an enzyme capable of converting tyrosine to L-DOPA should be sufficient to confer both betaxanthin and betacyanin production to anthocyanin-producing species. The requirement for few novel biosynthetic steps may have assisted in the evolution of the betalain biosynthetic pathway in the Caryophyllales, and facilitated multiple origins of the pathway in this order and in fungi. The stably transformed 35S: AmDOD arabidopsis plants provide material to study, for the first time, the physiological effects of having both betalains and anthocyanins in the same plant tissues. The variety of colours observed in flowers, fruits and vegetative tissues in plants are due to the presence of chromogenic plant secondary metabolites [1, 2]. These pigments serve diverse functions including photosynthesis and the protection of the photosynthetic machinery, attraction of pollinators and seed dispersers, and protection against biotic and abiotic stresses [1, 3]. In addition to their biological functions, plant pigments are also of much interest regarding their possible beneficial effects on human health, their use as natural colorants and their aesthetic value in ornamental and food crops . Non-chlorophyll plant pigments predominantly belong to two groups: flavonoids and carotenoids. Within the flavonoids, anthocyanins are the most significant type, providing a range of colours including orange, red, pink, mauve, purple and blue. However, in certain families within the order Caryophyllales, another class of pigments, the betalains, replaces the anthocyanins [2, 5, 6]. Betalains are only present in the order Caryophyllales and some fungi. They occur in most families of the Caryophyllales, but species of at least two families accumulate anthocyanin pigments instead . The basis of this differentiation is unknown, but may represent an initial evolution of betalain biosynthesis in an ancestor of the core Caryophyllales and then its subsequent loss on different occasions . No plant has yet been found that produces both betalain and anthocyanin pigments [5–8]. This mutually exclusive nature of the betalain and anthocyanin production in the plant kingdom is a curious phenomenon and the evolutionary and biochemical mechanisms for this restriction are unknown [5–7]. There are two major types of betalains, the red-purple betacyanins and the yellow/orange betaxanthins, both of which accumulate in the vacuole. The betaxanthins also emit green autofluorescence, which is not seen with the betacyanins [9–11]. While the production of flavonoids and carotenoids has been extensively studied and metabolically engineered in a variety of species, betalain biosynthesis has yet to be fully characterised [1, 2]. The betalain biosynthetic pathway is relatively simple with putatively only a few reactions that are enzyme catalysed (Figure 1). The initial biosynthetic step is the hydroxylation of tyrosine to L-3,4-dihydroxyphenylalanine (DOPA), attributed to the activity of a tyrosinase, although the exact role (if any) of tyrosinase in betalain synthesis has yet to be resolved [5, 6, 12, 13] Cleavage of the cyclic ring of L-DOPA by DOPA-4,5-dioxygenase (DOD) forms an unstable seco-DOPA intermediate, which is thought to spontaneously convert to betalamic acid. The formation of betaxanthins occurs spontaneously from the condensation of betalamic acid with amines/amino acids , probably in the vacuole. The classic model of betacyanin biosynthesis involves the condensation of betalamic acid with (most commonly) cyclo-DOPA, which again is a likely spontaneous step. In this model, cyclo-DOPA is formed from L-DOPA through an oxidation reaction that also has been attributed to tyrosinase activity [5, 6, 13] The conversion proceeds via an unstable dopaquinone intermediate, which spontaneously cyclizes to form cyclo-DOPA. Betacyanins are generally O-glycosylated (at the C-5 or C-6) and frequently subsequently acylated. The aglycone product of betalamic acid and cyclo-DOPA condensation is termed betanidin and the 5-O-glucosylated form betanin, as with the anthocyanidin/anthocyanin convention. The timing of the glycosylation, regarding whether it occurs on cyclo-DOPA or betanidin, has been debated [15, 16]. Schematic of the proposed biosynthesis pathway of betalains. Abbreviations are; 4,5DOD, DOPA-4,5-dioxygenase; DOPA-OX, DOPA oxidase; S, spontaneous conversion; TY-OHase, tyrosine hydroxylase. The steps for formation of the betacyanin glycosides are not shown. The only betalain biosynthetic enzymes characterised at the molecular level to date are for DOD and some of the glycosyltransferase activities. The first plant DOD gene characterised was from Portulaca grandiflora, and it defined a novel plant gene family of non-haem dioxygenases [2, 11]. The plant dioxygenase is phylogenetically unrelated to DOD from the fungi Amanita muscaria, although the fungal sequence can complement betalain production in flowers of a P. grandiflora dod mutant . The plant DOD carries out only the 4,5-cleavage of DOPA to yield betalamic acid, whereas the fungal enzyme can also conduct 2,3-extradiol cleavage of DOPA, yielding the yellow pigment muscaflavin . Three cDNAs encoding proteins with relevant O-glycosylation activity have been identified, two that use both betanidin and flavonoids as substrates [19, 20] and one that uses cyclo-DOPA . Studies seeking to understand the genetic basis of the mutual exclusion of betalains and anthocyanins have focused on establishing the extent of the retention of the anthocyanin biosynthetic pathway in betalain producing species [21–23]. Flavonoids are present in betalain producing species, including flavonols and proanthocyanidins, and functional genes have been identified for the flavonoid biosynthetic enzymes chalcone synthase, dihydroflavonol 4-reductase and anthocyanidin synthase [21–23]. This suggests that the lack of anthocyanin production in betalain-producing species may be due to a lack of transcriptional activation of all the necessary biosynthetic genes [7, 23], although a hypothesis based on repressive interaction between anthocyanin and betalain metabolites and the biosynthetic enzymes has also been suggested . Our aim in this study was to determine whether betalain production is possible in anthocyanin-producing species. Using genetic transformation and feeding of pathway intermediates, we have examined what the minimum number is of biosynthetic steps that must be introduced into an anthocyanin-producing species to allow betalain production, and whether betalains can accumulate to significant levels in such species. Stable or transient transgene expression was used with DOD cDNAs from the fungus A. muscaria and the plant P. grandiflora, introduced into Arabidopsis thaliana (arabidopsis) plants, Solanum tuberosum (potato) cell cultures and Antirrhinum majus (antirrhinum) petals. These are representatives of the asterids and rosids, the two major clades of eudicots. 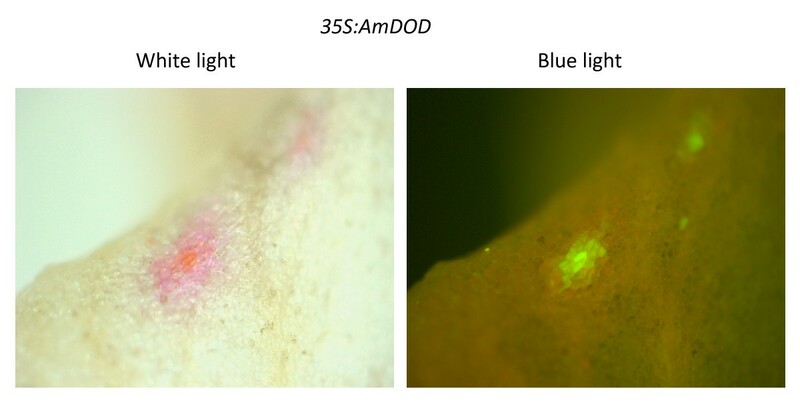 Potato cell suspension cultures were transformed using particle bombardment with 35S: green fluorescent protein (GFP) or constructs having either the P. grandiflora DOD cDNA (35S: PgDOD) or the A. muscaria DOD (35S: AmDOD) driven by the CaMV35S promoter, and examined for betalain production following feeding with L-DOPA. In cells transformed with 35S: GFP, GFP was detected in the cells 24 h after biolistic transformation but no pigmentation was apparent (data not shown). In the cells transformed with either 35S: PgDOD or 35S: AmDOD and fed L-DOPA, pigmented multi-celled clusters were apparent within 24 h post-bombardment (Figure 2). Both 35S: AmDOD and 35S: PgDOD resulted in yellow and orange cell clusters. In addition, 35S: AmDOD also produced cells with red pigmentation. The yellow and red pigmentation suggests that betaxanthin and betacyanin production, respectively, had been conferred to the cells. Indeed, observation of the yellow pigmented areas under blue light showed the autofluorescence characteristic of betaxanthin pigments (data not shown). Pigment production in potato cell suspension cultures biolistically transformed with 35S: PgDOD or 35S: AmDOD and fed 10 mM L-DOPA. Examples are shown of cells with the resulting yellow to orange (35S: PgDOD) or yellow to red (35S: AmDOD) pigmentation. The adaxial surface of dorsal petals of antirrhinum was transformed using particle bombardment with 35S: PgDOD and examined for betalain production with or without infiltration of the petals with L-DOPA. Petals biolistically transformed with 35S: GFP vector and fed with L-DOPA were used as an additional control. Antirrhinum lines having mutations in flavonoid production were used to provide anthocyanin-free petal backgrounds upon which to observe any pigment production. 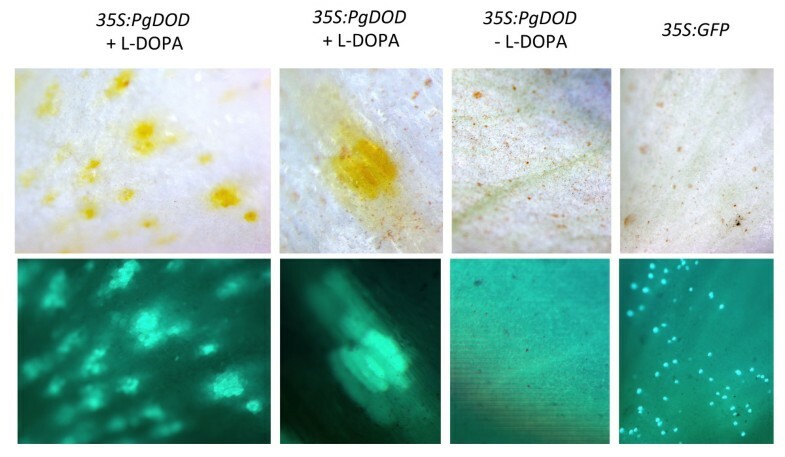 No pigments were visible in 35S: GFP shot tissue or in petals transformed with 35S: PgDOD but not infiltrated with L-DOPA, although positive GFP foci were apparent (Figure 3). The 35S: PgDOD petals that were infiltrated with L-DOPA had numerous, multi-celled yellow foci 24 h after infiltration (48 h after bombardment) (Figure 3), indicating betaxanthin production. The yellow foci did indeed have the strong green autofluorescence typical of betaxanthins when observed under blue light (Figure 3). When using the 35S: AmDOD construct, both yellow/orange and pink/red multi-celled foci occurred (Figure 4), although the pink/red foci were present only inconsistently (data not shown). Similarly, pink foci were sometimes present in some replicate experiments using 35S: PgDOD (data not shown). The pink colouration indicates betacyanin production. The pink regions did not show strong autofluorescence while the central cells did, indicating possible betacyanin accumulation around a central region containing both betacyanins and betaxanthins. Betaxanthin production in antirrhinum petals transiently transformed with 35S: PgDOD or 35S: GFP. Plasmid constructs containing 35S: PgDOD or 35S: GFP were introduced into the adaxial epidermis of antirrhinum petals using particle bombardment. At 24 h after bombardment some 35S: PgDOD bombarded petals were infiltrated with 10 mM L-DOPA, while the other petals were infiltrated with water, and incubated for a further 24 h before observation. Representative petals are shown as viewed under white light (upper row) or blue light (lower row). The yellow, multi-cell foci for 35S: PgDOD petals fed with L-DOPA are shown at two magnifications. Pigment production in antirrhinum petals transiently transformed with 35S: AmDOD. A plasmid construct containing 35S: AmDOD was introduced into the adaxial epidermis of antirrhinum petals using particle bombardment. At 24 h after bombardment the bombarded petals were infiltrated with 10 mM L-DOPA and incubated for a further 24 h before observation. A representative petal is shown as viewed under white light (left) or blue light (right). HPLC analysis (LC-DAD) was used to examine the nature of the yellow pigments produced following bombardment with 35S: PgDOD. The ridge region of the petals was chosen for HPLC analysis, to ensure a similar region was sampled in each case. Betaxanthins and betacyanins have absorbance maxima at around 470 nm and 538 nm, respectively , and peak profiles were examined at these two wavelengths (Figure 5). No betalain-related peaks were detected with HPLC analysis of the 35S: GFP petal tissue or with 35S: PgDOD petals that were not infiltrated with L-DOPA. Petals transformed with 35S: PgDOD and fed L-DOPA showed distinct peaks at both 470 nm and 538 nm. The compounds represented by the peaks were putatively identified by comparison of HPLC retention times and spectral data against those of a standard extract (from beetroot, Figure 5A and 5E) and reported spectral data [14, 25, 26]. The beetroot extract showed the expected peaks for the betaxanthin vulgaxanthin I (Peak 1) and the betacyanins betanin (betanidin 5-O-glucoside, Peak 2) and isobetanin (Peak 3) (Table 1). The 35S: PgDOD L-DOPA fed samples showed a small amount of betanin (Peak 2; Figure 5F) and an unknown peak (Peak 5, 21.02 min; Figure 5B) that was possibly dopaxanthin (Table 1). Generally, the chromatograms at 538 nm showed the same patterns as at 470 nm except that vulgaxanthin I (Peak 1) and the putative dopaxanthin peak (Peak 5) were no longer detected, providing further evidence that Peak 5 is indeed a betaxanthin. HPLC analysis of pigments produced in antirrhinum petals transiently transformed with 35S: PgDOD or 35S: GFP. HPLC analysis was conducted on the 35S: PgDOD and 35S: GFP antirrhinum petal material shown in Figure 3. Absorbance was monitored at 470 nm for betaxanthins or 538 nm for betacyanins. 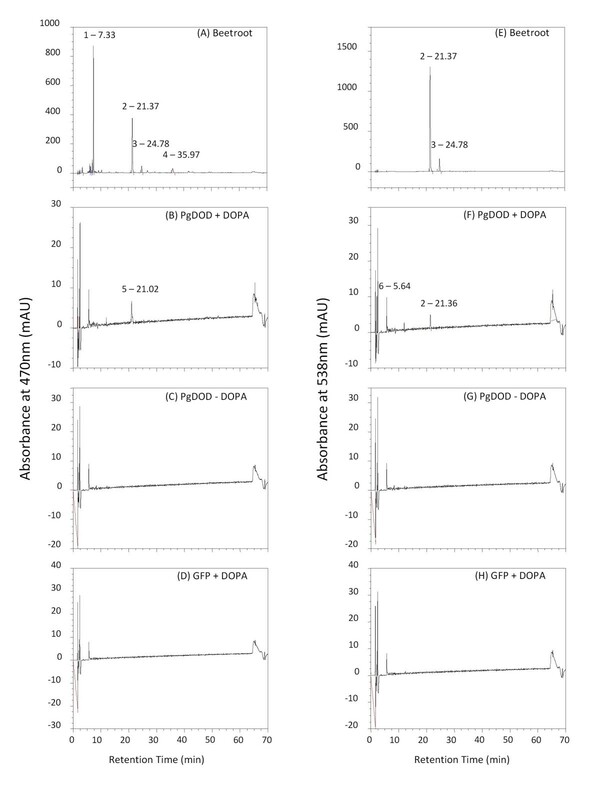 Chromatograms are for extracts from beetroot root (A and E), 35S: PgDOD antirrhinum infiltrated with L-DOPA (B and F), 35S: PgDOD antirrhinum without L-DOPA infiltration (C and G), 35S: GFP antirrhinum infiltrated with L-DOPA (D and H). The retention times of the major peaks are shown, and these were tentatively identified as per Table 1. Retention times and spectral maxima of the major betalain pigments detected in beetroot tissue (Peaks 1 to 3) or antirrhinum petal tissue bombarded with 35S: PgDOD and infiltrated with L-DOPA (Peaks 4 and 5). aThe peak present at 5.64 min in antirrhinum tissue was present in all samples, both control and transgenic; its spectral data is not consistent with that of betalain pigments therefore it was excluded from the analysis. Antirrhinum can produce yellow pigments in the petal face and throat naturally. These pigments are aurones and a product of the flavonoid pathway. In addition to the spectral data (aurones have spectra maxima in the range 390-430 nm), there is other evidence that the yellow pigments observed following 35S: PgDOD bombardment and L-DOPA feeding are unlikely to be aurones; aurones are not present normally in the dorsal petals of the antirrhinum line used (JI19), and no yellow pigments were observed without infiltration with L-DOPA. Despite a lack of the red colouration seen following bomardment, the 35S: PgDOD antirrhinum samples analysed by HPLC did indeed contain small amounts of betacyanin (betanin; Figure 5F). Also, the presence of betacyanin is inferred in the 35S: AmDOD expressing potato cells, given the red colouration of some foci. How betacyanin production can occur in non-betalain species through the introduced DOD acting on the supplied L-DOPA is not clear. The product of DOD action on L-DOPA is betalamic acid (Figure 1). Betaxanthins can be produced by spontaneous reactions of the DOD reaction end-product, betalamic acid, with amino acids or amines. However, betacyanin formation requires cyclo-DOPA, the formation of which from L-DOPA by oxidation has been attributed to the activity of a tyrosinase . As tyrosinases are frequently present in plant cells it is possible that an endogenous enzyme with activity on L-DOPA occurs in most non-betalain producing species. Alternatively, betacyanin could be formed from endogenous tyrosinase activity on dopaxanthin . The betacyanin detected in antirrhinum petals was likely betanin, an O-glycosylated betacyanin. This indicates that endogenous glycosyltransferases can act on the novel betacyanin substrates. Two O-glucosyltransferases have been characterized with activity on betanidin [19, 20]. Both show sequence similarity to the O-glycosyltransferases involved in anthocyanin biosynthesis, and indeed, the betanidin 5-O-glucosyltransferase has activity with both betacyanins and flavonoids . Thus, it may be the case that the endogenous flavonoid O-glucosyltransferases of antirrhinum are also able to act on betanidin (and/or cyclo-DOPA). Biolistic transformation of both potato and antirrhinum with either 35S: PgDOD or 35S: AmDOD resulted in muli-celled foci producing betalains. It is unlikely that this would be due to movement of the DOD enzyme between cells as, similar to GFP (Figure 3), it is too large for passive intercellular movement. As the final betalain pigments accumulate within the vacuole, this suggests that some of the precursors migrate between cells. This is similar to the results of Mueller et al. when they biolistically introduced AmDOD into different P. grandiflora mutant backgrounds. Single coloured cells seen within 18 h after bombardment developed into multi-cell foci by 48 h after bombardment . It was suggested that betalains could have diffused through plasmodesmata to neighbouring cells. However, in contrast to these results, when complementation of the P. grandiflora dod mutant was conducted with PgDOD, only single cell foci occurred . Furthermore, cell-specific betalain production is commonly observed in plants, such as in the epidermal cells of petals. In the case of our results, it is possible that high L-DOPA levels produced from tissue feeding allowed the movement of betalamic acid not just to the vacuole but also to neighbouring cells. Stably transformed arabidopsis plants were produced through Agrobacterium-mediated transformation with 35S: AmDOD. T2 generation seedlings were checked for expression of the 35S: AmDOD transgene (Additional file 1) and selected lines examined for their potential to produce betalains when fed with L-DOPA. When whole seedlings were fed L-DOPA, novel pigment production was visible within 12 h after feeding (Figure 6A-C), including in the etiolated root tissues and the hypocotyls. The colour ranged from pale yellow through to orange and dark orange-red. Under blue light, the pigments showed the green autofluorescence characteristic of betaxanthins (Figure 6D, E). When detached inflorescences from mature plants were fed L-DOPA pale yellow pigmentation was seen in all tissues 24 h after feeding, including the stem, petals and siliques, and this was accompanied by strong autofluorescence (Figure 7). 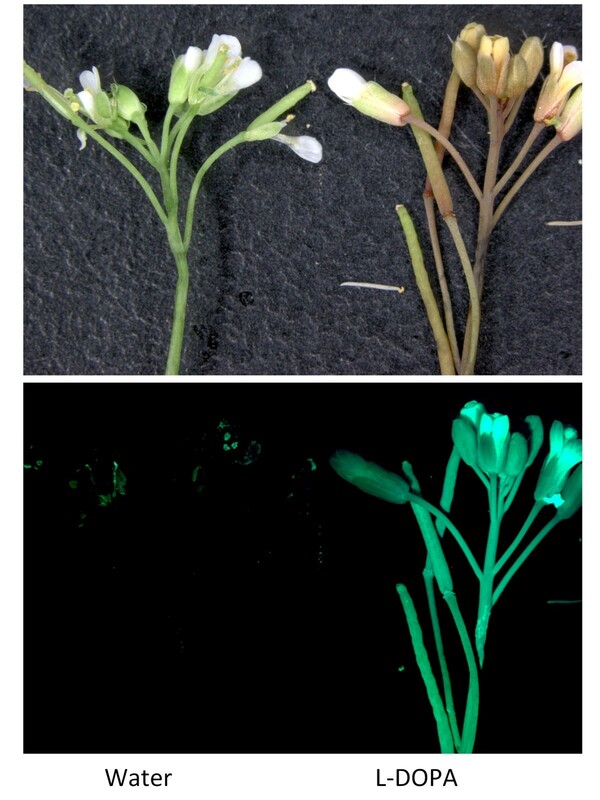 35S: AmDOD seedlings or inflorescences not fed L-DOPA did not produce visible pigments after treatment and did not show significant autofluorescence under blue light (Figure 6F, G and Figure 7). 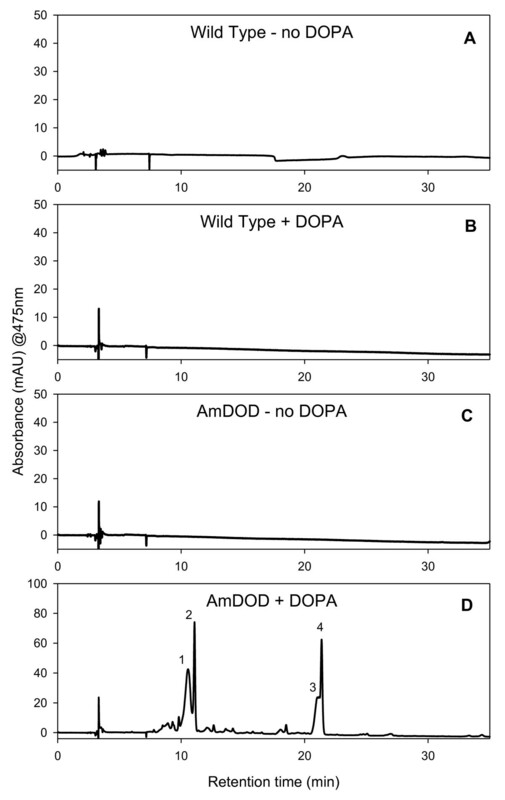 Betaxanthin production in arabidopsis seedlings stably transformed with 35S: AmDOD. 35S: AmDOD seedlings were grown on moistened filter disks either with (A to E) or without (F and G) 10 mM L-DOPA. Those fed L-DOPA accumulated yellow to orange/red pigments (A to C) and under blue light showed the autofluorescence typical of betaxanthins, as illustrated for the cotyledon (D) and hypocotyl (E). The seedlings not fed L-DOPA did not produce coloured pigments in either their cotyledons (F) or hypocotyls (G). Pigment production in inflorescences of arabidopsis plants stably transformed with 35S: AmDOD. Inflorescences from 35S: AmDOD arabidopsis line 6 were infiltrated with either water or 10 mM L-DOPA for 24 h and examined under white light (upper panel) or blue light (lower panel). Those fed L-DOPA accumulated yellow to orange pigments and under blue light showed the autofluorescence typical of betaxanthins. The inflorescences not fed L-DOPA did not produce visible coloured pigments and did not show autofluorescence. HPLC analysis was used to examine the nature of the pigments produced following L-DOPA feeding of the 35S: AmDOD arabidopsis. Seedlings were fed L-DOPA and the entire seedling sampled for chemical analysis. HPLC analysis revealed several peaks present in the L-DOPA fed 35S: AmDOD tissue but not in the control tissue (Figure 8). Four of these peaks were present in sufficient quantity to confirm that their spectral data and retention times were those characteristic of betaxanthins (Table 2). HPLC analysis of pigments produced in arabidopsis seedlings stably transformed with 35S: AmDOD. Seedlings, representatives of which are shown in Figure 6, were grown on moistened filter paper with or without the addition of 10 mM L-DOPA and the pigments present examined using HPLC. Samples from wild-type (non-transgenic) arabidopsis and from beetroot root were included for comparison. Absorbance was monitored at 475 nm for betaxanthins. The retention times of the major peaks are shown, and these were identified as betaxanthins per Table 2.
aSpectral data for all four peaks was generally consistent with data reported previously for betaxanthins, but no specific betaxanthin assignments were made. bPeak one has a retention time and spectrum consistent with that of Vulgaxanthin I, as reported for extracts from beetroot  and as compared against a beetroot extract run in the same experimental set. The presence of betaxanthins matched the strong autofluorescence observed in the seedlings under blue light. The failure to detect the presence of betacyanin was a surprise given the orange/red colouration of the seedlings and the ability of DOD to confer both betaxanthin and betacyanin production when transiently expressed in antirrhinum petals. In accordance with the HPLC results, while the seedlings did have an orange-red colour that would suggest betacyanin production, the autofluorescence indicated strong betaxanthin presence. Furthermore, the fed inflorescences off the mature plants did not have a red colouration. Thus it appears that a high level of betaxanthin production in the particular background colouration of the seedlings resulted in the orange-red colour. It is unlikely that anthocyanins are contributing to the orange-red colouration of seedlings, as L-DOPA treatment of non-transgenic seedlings did not induce visible pigment production. We report here methods to enable production of high-levels of betalains in the non-betalain, anthocyanin-producing, species antirrhinum, arabidopsis and potato, which represent both of the major clades of the eudicots. Betalains are not normally observed in anthocyanin-producing species, for unknown reasons. The introduction of a single enzyme (DOD) and feeding of that enzyme's substrate (L-DOPA) were sufficient to induce both betaxanthin and betacyanin production. Although many steps in betalain production are suggested to be spontaneous, it is somewhat surprising that betacyanin production occurred. It indicates the background presence of an enzyme able to convert L-DOPA to cyclo-DOPA, or dopaxanthin to betacyanin/betanidin, and O-glycosyltransferases with activity against betanidin. Thus, it is likely that introduction of just two enzymes, DOD and the (currently uncharacterised) enzyme for conversion of tyrosine to L-DOPA, should be sufficient to confer betaxanthin and betacyanin production to anthocyanin-producing species. The requirement for few novel biosynthetic steps may have assisted in the initial evolution of this pathway in the Caryophyllales. A relatively simple mechanism for betalain biosynthesis would also support the multiple origins of the pathway in the Caryophyllales and in some fungi . Given the extensive knowledge available on anthocyanin production and function in arabidopsis, the stably transformed 35S: AmDOD arabidopsis plants should provide excellent material to study, for the first time, the physiological effects of having both betalains and anthocyanins in the same plant tissues. 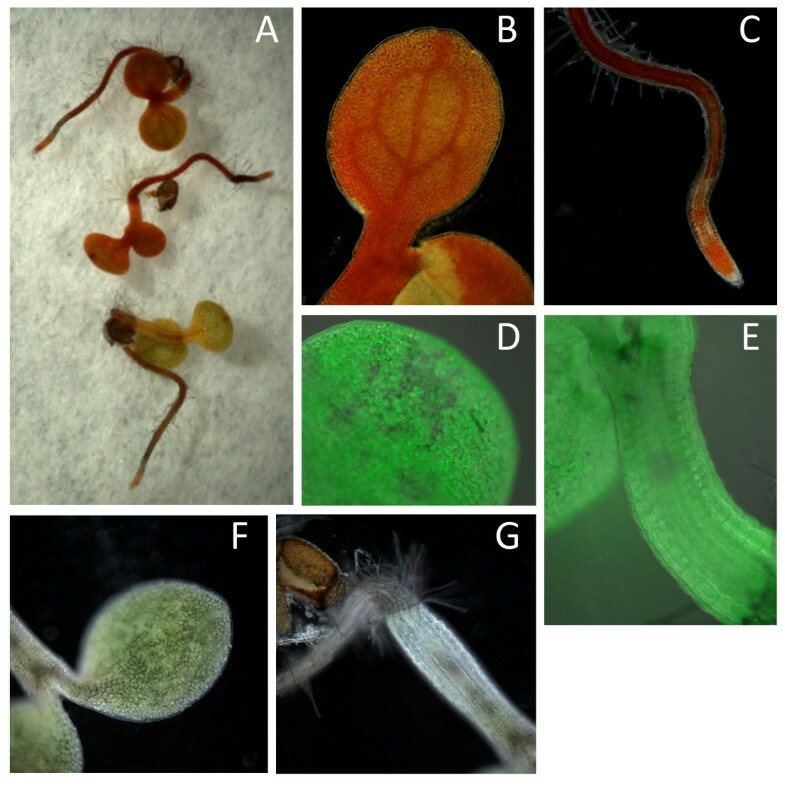 The large collection of mutant lines in arabidopsis should also allow aspects of betalain biosynthesis, such as vacuolar transport, to be examined. Antirrhinum majus plants were grown under standard glasshouse conditions in Palmerston North, New Zealand. The glasshouse was heated at 15°C and vented at 25°C, without supplementary lighting. Two antirrhinum lines were used. Transformation with 35S: PgDOD used line JI19, which produces aurones and flavones but not anthocyanins in the petals, as it is lacking in flavanone 3-hydroxylase activity (homozygous incolorataII). 35S: AmDOD transformation used either JI19 or rosea dorsea , which carries a mutation in the R2R3MYB gene Rosea1 and lacks anthocyanin production in the adaxial epidermis of the petals . Arabidopsis thaliana transformation used the Colombia ecotype. Potato cell cultures were obtained by placing 2 cm2 pieces of potato callus in 50 mL of modified liquid MS media  per cotton-plugged 250 mL flask. These cultures were incubated at room temperature (23-27°C) with shaking on an orbital shaker at 100 rpm in the dark. Subculturing was carried out every two weeks with 3 mL of the cell culture used to inoculate a fresh 50 mL of liquid media. A cDNA for the ORF of DOD was RT-PCR amplified from mRNA prepared from P. grandiflora betalain pigmented petals using primers designed to the published sequence . The forward primer was 5'-AGTCAGAATCCATGGGTGTTGGGAAGGAA-3', with the first ATG matching the initiation ATG for DOD, and the reverse primer was 5'-AGTCATCTAGAATCATATGGAAGTGAACT-3', which incorporated an XbaI site. Standard PCR conditions were used with Taq Polymerase (New England Biolabs, Massachusetts, USA) and cycling parameters of 94°C for 4 min, then 30 cycles of 94°C for 30 s, 60°C for 30 s and 72°C for 1 min, with a final extension phase of 72°C for 7 min. The products were cloned into pGEM-T-Easy (Promega, Wisconsin, USA) and confirmed as PgDOD by DNA sequencing. The cDNA was then excised as an EcoRI/XbaI fragment and ligated into EcoRI/XbaI digested pART7  to from the vector pPN314. The 35S: AmDOD construct for particle bombardment, containing the A. muscaria 4,5-DOPA dioxygenase cDNA driven by the CaMV35S promoter, was pNcoDod  (courtesy of Dr. Willibald Schliemann, Leibniz-Institute of Plant Biochemistry, Germany). The binary vector pPN166 for transformation into arabidopsis was constructed by taking the CaMV35S-cDNA region from pNcoDod as a PvuII fragment and cloning it into the NotI site (after flushing by end-filling) in the binary vector pMLBART (a gift from Dr Bart Janssen, Plant & Food Research). The 35S: GFP construct was pPN93. Vectors were verified by restriction fragment analysis and/or DNA sequencing. Antirrhinum particle bombardment experiments were performed as described in Shang et al. , with the following variations; the pressure setting was 300 or 400 kPa, the shooting distance 11-12 cm, and petals were bombarded twice. The final DNA concentration for DOD constructs was 1 or 2 μg DNA per mg of 1.0 μm gold particles. Controls included gold particles alone (no DNA) and 35S: GFP (added at 0.4 μg DNA per mg of 1.0 μM gold particles). Prior to bombardment the petals were surface sterilised by immersion for 15 min in 10% (v/v) bleach containing a few drops of Tween-20, followed by three rinses in sterile water. The adaxial surface of the dorsal petals was bombarded. After bombardment, the plant materials were then cultured on 1/2 MS medium under 20 - 50 μmol m-2 s-1 light from Osram 36 W grolux fluorescent tubes (16 h photoperiod) at 25°C. At least two flowers were used for each construct per experiment, and each experiment was repeated at least twice. Potato cell suspension cultures for particle bombardment-mediated transformation were prepared by filtering 3 mL of culture onto sterile filter paper and sub-culturing them on a solid media in tubs for 48 h prior to transformation. The biolistic parameters were the same as those used for the antirrhinum petals with exception that they were only bombarded once. A sterilised metal grid was placed over the cells, on top of the culture tub, to prevent displacement of the cells from the helium in-flow. The floral spray method developed by Clough and Bent  was used for the transformation of arabidopsis. Seeds were harvested from the Agrobacterium-inoculated plants and transgenics selected by spraying germinating seedlings with glufosinate herbicide (Basta, Bayer Crop Sciences). Positive transformants were grown through to production of T2 seeds following self-pollination. Infiltration of antirrhinum petals with L-DOPA was carried out 24 h after biolistic transformation. The petals were placed in 10 mM L-DOPA solution and a brief vacuum (30-60 s) applied, until the solution boiled vigorously and the petals became translucent. Following infiltration excess solution was blotted off and the petals incubated on 1/2 MS medium under the same conditions as post-bombardment. Control petals were handled in the same manner but with sterile water substituted for L-DOPA. Petals were observed for betalain production after a further 24 h. Transformed potato cell cultures were fed with 10 mM L-DOPA solution by dispensing 1 mL of the solution on to the filter disks supporting the cells. The L-DOPA solution was applied to half of the samples immediately after transformation. Germinated arabidopsis seedlings were fed with 10 mM L-DOPA by transfer of the filter paper containing the seedlings on to a plate containing L-DOPA solution. Seedlings were observed for betalain pigment production after a further 12 h. For feeding of inflorescences, six inflorescences were collected from 35S: AmDOD line 6 and cut to 1 cm long. Three inflorescences were immersed in 10 mM L-DOPA solution and the other three immersed in water, and both sets were left for 2 min. The inflorescences were then placed into 1.5 ml Eppendorf tubes with either 0.5 ml of 10 mM L-DOPA solution or water, and the tubes left open on the bench for 24 h.
RT- PCR analysis for DOD transgene expression in 35S: AmDOD arabidopsis plants used total RNA extracted from leaf tissue following the RNeasy protocol of the Qiagen RNeasy mini kit. Five rosette leaves were sampled from each of six individual T2 lines, as well as a non-transgenic wild type line. Following DNAse I treatment 500 ng of RNA from each sample was used to generate cDNA using the Roche Transcriptor First Strand cDNA Synthesis Kit. PCR used Taq polymerase (Roche, New Zealand) and the following primers: DODF1 5'-CATACTACCATGTCCACCAAG-3', DODF2 5'-AGCACTGCTTCTATATCGTC-3', Act2S 5'-TCCCTCAGCACATTCCAGCAGAT-3', Act2AS 5'-AACGATTCCTGGACCTGCCTCATC-3'. The Actin primers correspond to the arabidopsis Actin2 gene (AT3G18780). The thermocycling conditions were 94°C for 2 min and 25 cycles of 94°C for 20 s, 55°C for 30 s and 72°C for 30 s. The PCR products were separated on a 1% (w/v) TBE agarose gel containing ethidium bromide and visualised using UV-illumination. PCR products were also cloned and sequenced to confirm that the target PCR product was being amplified. For arabidopsis analysis whole seedlings were extracted. For antirrhinum analysis, to ensure that similar petal regions were being compared, the ridge region of the biolistically transformed petals was excised away from the remainder of the petals for chemical analysis. The ridge is a distinct raised area that divides the lobes and throat of the dorsal petals. Ridge tissue from between three and six petals was pooled to give total sample fresh weights of 60 to 300 mg. Absorbance at 470 nm and 538 nm was used for detection of betaxanthins or betacyanins, respectively. Beetroot (20 mg freeze dried sample of red root) was used as a standard source of betalains, and strong peaks with the expected retention times and spectra data were observed. Each sample was extracted three times in 1 ml of 80% (v/v) methanol containing 50 mM sodium ascorbate, as described in Schliemann et al. , with one overnight extraction at 4°C. The samples were centrifuged for 4 min at 10,000 rpm, the supernatant removed and the pellet re-extracted in the next 1 ml of 80% methanol with ascorbate. The supernatants once removed, were combined to give the crude extract. The extract was dried in vacuo on a Savant SC210 Speedvac to near dryness, then freeze dried overnight to complete dryness. Extracts were resuspended in MilliQ water and made up to a final volume of 500 μl. The extracts were syringe filtered through a 0.45 um nylon filter as per Svenson et al. and the pigments analysed by high performance liquid chromatography (HPLC). The analysis of the antirrhinum samples used a Dionex 3000 Ultimate solvent delivery system with a Phenomenex Luna (5 μm, 150 × 4.6 mm) RP-18 endcapped column (column temperature 30°C) and a Dionex 3000 Diode Array Detector (DAD). Elution (1 ml min-1) was performed using a solvent system comprising solvent A [1.0% formic acid in water] and solvent B [80% acetonitrile in water] and a linear gradient starting with 100% A, decreasing to 80% A at 62 mins, and then a linear gradient to 100% B at 67 mins, remaining at 100% B for a further 3 min, then returning to initial conditions. Betaxanthins were detected at 470 nm and betacyanins at 538 nm . The analysis of the arabidopsis samples used the solvent system of Schliemann et al. . It was conducted on a Hewlett Packard HP 1100 with two Merck Chromolith analytical columns and a C-18 guard column. We thank Ian King and Julie Ryan for care of plants, Steve Arathoon and John Harris for technical assistance, Willibald Schliemann for the A. muscaria 4,5-DOPA dioxygenase cDNA vector, Andrew Gleave for pART7, Bart Janssen for pMLBART, Simon Coupe for pPN93, and the New Zealand Foundation for Research, Science, and Technology contract C02X0805 for supporting KES, SCD and KMD. NNH thanks The Todd Foundation, The Freemasons, NZ Federation of Graduate Women and the J. Skipworth Scholarship for their financial support. KEC thanks Victoria University for her PhD scholarship grant. NNH conducted the AmDOD biolistic experiments in antirrhinum, produced and contributed to the analysis of the arabidopsis plants, and contributed to writing of the manuscript; JJ made pPN314 and conducted the biolistic experiments in potato; KMD conducted the PgDOD biolistic experiments in antirrhinum and wrote the main manuscript draft; DHL conducted the HPLC analysis of biolistically transformed material and contributed to the manuscript draft; PEJ contributed to supervision of JJ and NNH and project design; SCD assisted with cell culture experiments and supervision of JJ; KEC conducted PCR analysis and inflorescence feeding for the arabidopsis plants; KSG contributed to supervision of KEC. KES conceived and coordinated the study, supervised NNH and JJ, and contributed to analysis of the results and writing of the manuscript. All authors read and approved the final manuscript.